There are no special requirements for the Server EA regarding Magic Number. By default it will pick up all the positions on the master account regardless to what Magic Number those positions have. But there are some important things to know about the Magic Number on the Client EA. If you have only single Client EA running on each MT4 slave account then you can just leave the magic number at its default value, which is zero. Nothing special is required when you have only one Client EA on MT4 account. 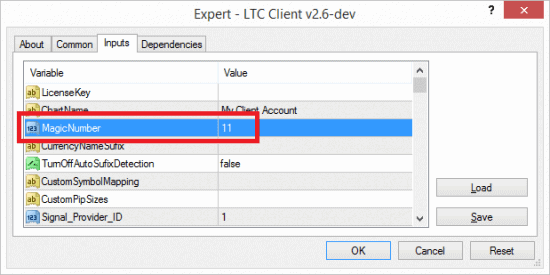 However, if you need to run more than one Client EA on the same MT4 account you will have to use unique magic number for each additional EA. For example say you need to run 4x Client EA instances on the same MT4 account. For that you will need to open 4 currency charts and attach Client EA to each of them. When you attach Client EA to each chart you will be prompted to set the EA settings and this is where you need to set different Magic Number for each EA. Magic Number option in the Client EA of the Local Trade Copier app for MT4 client terminal. Simple example for those 4x Client EA’s would be to use magic numbers like 11, 12, 13 and 14 respectively. Also, if you use 3rd party EA’s on the same MT4 account, make sure they do not use the same magic number as your Client EA’s are using (even if you are running other EA’s on the same MT4 account on another computer). And the most important thing to remember is that when the Magic Number is set to anything above zero the Client EA will not copy the “Partial Close” and “Close By” operations. If you do not have a this software yet it is the best time to buy Local Trade Copier. 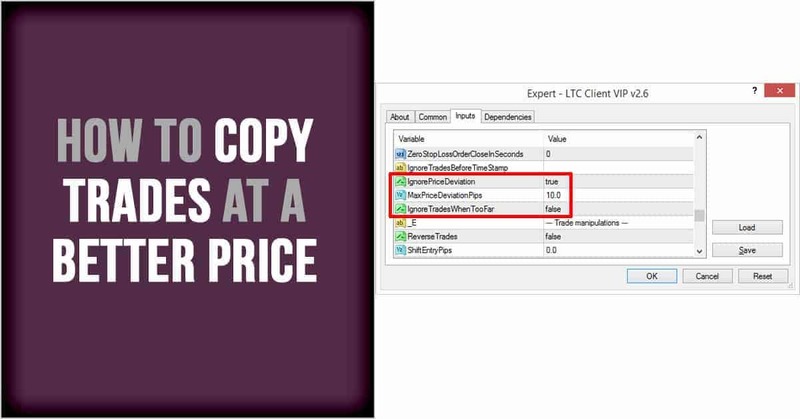 LTC helps Forex account managers to copy their trading positions between multiple MetaTrader 4 accounts so they won’t need to repeat the same trade operations on each MT4 platform individually. hi Rimantas : Can I use this copier with my Ea and send all my signal and modification to my clients, with out fail. and I can have a 30 day trail? Local Trade Copier does not send signals to clients on another computers over the Internet, if that’s what you need. It can only copy trades when master MT4 and client MT4 are on the same computer. If you want to send trades/signals to clients on another computers all around the world, you need Remote Trade Copier. As about “without fail”, all software fail, I cannot guarantee anything like this. What I know is that my LTC works great for me and my clients, especially those who take the time to learn and study instruction manual. Yes, you can have 30-day trial as explained on my website. Also, it does not matter if you use EA or trade manually, the trades can be copied.